In 2017 the vGIS Team jointly with Promark-Telecon (www.Promark-Telecon.ca), a leading Canadian locate services provider, commenced a study to evaluate the effectiveness of Augmented Reality in the locate services industry. By collecting empirical data over the course of several months, the study measured the impact of applying augmented reality technology to utility locates using multifaceted criteria, including productivity, safety and locate accuracy. The introduction of new technologies has made it possible to improve traditional fieldwork practices with advanced visualization tools, such as Augmented Reality (AR). This study evaluates the impact of such technologies in real-life conditions, using empirical data collected in collaboration with a leading locate services company. The initial findings of this ongoing study indicate that the application of advanced AR tools to locate service reduces the time to complete locates by up to half. The impact on the completion time appears to vary depending upon the type of locate, the duration of the locate, the competency of the locator, the amount of retired and in-service infrastructure the owner has in the ground and the complexity of the infrastructure owner records. The study identified time savings of 12–20 hours per locator per month. This approximately 10% productivity boost recorded by the study confirms the vast potential of visualization technologies in the locate industry and the utilities space in general. Municipalities and utility companies maintain vast networks of underground and above-ground infrastructure. This infrastructure is difficult to access—many assets such as pipes, cables, valves, etc. are buried underground—and often complex, as multiple utility types are densely packed. This combination of complexity and inaccessibility leads to high costs for any infrastructure-related initiative. Additionally, the inability of utility workers to see buried assets directly occasionally leads to excavation damages, which are estimated at $6B annually for North America alone. The traditional approach to locating utility assets relies on using printed and digital maps in conjunction with specialized equipment such as electromagnetic locator devices. The locator then paints the horizontal location of the asset on the ground, produces a sketch and compiles a report. The sketch and report are then provided to the excavator. Often, the locate is independently validated by another person through a quality assurance process. The locate work process is complicated, relies on records that can—at times—be inaccurate or incomplete, involves personnel with varying degrees of experience and is an important component of the damage prevention and workplace safety programs for the construction industry. The application of AR to locate work provides an opportunity to improve the process and outcomes (productivity, accuracy and safety) evaluated in this study. Emerging technologies such as AR have great potential to positively influence the work of locating. Using AR tools, locators can see an unobstructed physical world in front of them, as well as holograms of lines and pipes underground. By simply following the holographic projection on the ground, a locator should be able to perform the job faster, more easily, more safely and more accurately. The benefits of applying advanced visualization technology to locates is self-evident to augmented reality practitioners. Yet, due to the novelty of AR technology, reliable studies measuring the benefits have not previously existed. Despite the assumed benefits of the technology, there are a multitude of factors that may impact its real-life performance, rendering the technology beneficial in theory but not in practice. For instance, the incompleteness or low accuracy of GIS data, faced by most utility asset owners, may impair locate jobs; environmental conditions may affect hardware performance; or individual use cases specific to a location or the nature of the job may make any AR system impractical. To validate the hypothesis of augmented reality’s applicability in the locate services industry and measure the effectiveness of AR for locates, the leading developer of visualization solutions, vGIS (www.vGIS.io), has joined forces with a leading Canadian locate services provider, Promark-Telecon (www.Promark-Telecon.ca). The joint research focuses on an empirical analysis of the impact of AR aids on the locate process. The study focused on measuring the effectiveness of applying augmented reality technology to locates using multifaceted criteria including productivity, safety and locate accuracy. The study was conducted from January 2018 through May 2018 using the leading AR solution developed by vGIS (https://www.vgis.io/ar-mr-vr-gis-visualization-for-utilities-municipalities-locate-and-municipal-service-companies/). During that period, the Promark study participants recorded the time that it took to perform locate tasks with and without vGIS. The time was rounded to the closest descriptive value (e.g., 10, 15, 20, 30 or 45 minutes). In addition to the time measurements, for each locate job, the Promark study participants recorded the technology’s impact on several other factors, including safety and locator accuracy. The study was conducted in the city of Toronto, a major metropolitan setting containing a diverse mix of personal housing, industrial and commercial buildings reflective of the conditions commonly found in many other locales. In addition to its zoning diversity, Toronto possesses an assortment of new and aging infrastructure, well-documented and sporadically documented assets and a variety of working environments. 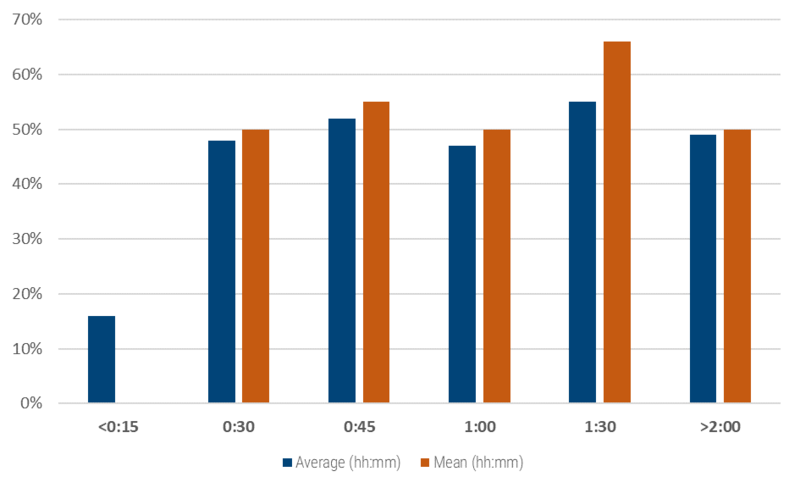 The time savings identified by the Promark study participants ranged from none to four hours. In 11% of the cases, the locator was unable to realize any time savings using vGIS. For most locate jobs (72%), the savings fell into the 10–30-minute range. 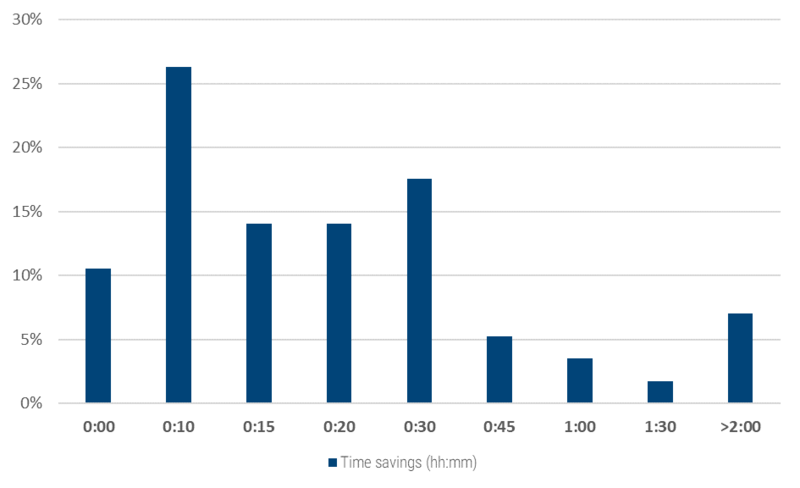 In 10% of situations, the study participants saved between 45 and 90 minutes, and in 7%, the savings exceeded 2 hours. The average time saved was 30 minutes, and the mean was 15 minutes. Fig. 2 shows the time savings as a percentage of the total job duration. 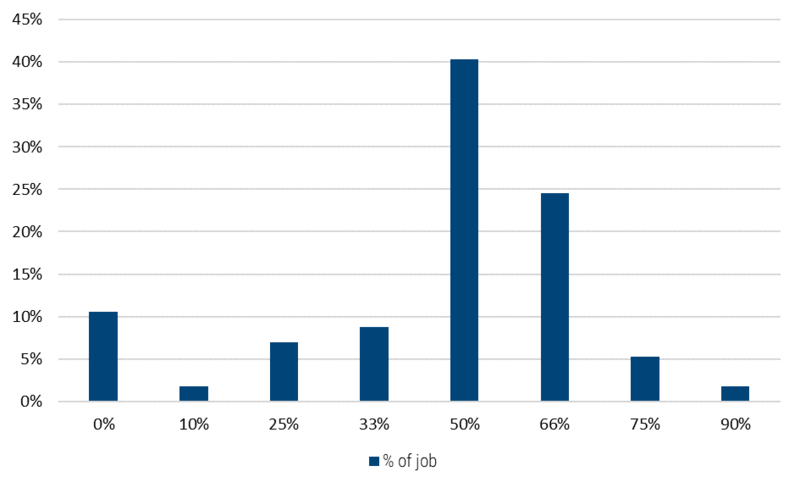 In most cases (40%), the locator was able to cut the job time by half. In 32% of all instances, the participants realized time savings of 66% or more. Observations suggest that for smaller jobs of 15 minutes or less, the savings were negligible (Fig. 3). However, for jobs requiring 20 minutes or more, the savings were consistent at around 50%. The study did not identify statistically significant differences based on the infrastructure type (e.g., gas vs. water vs. sewer). However, informal feedback suggested that the information completeness for a given utility in the area—something that this study did not measure—played a major role. The more complete the utility records, the greater the benefits of the AR visualization system. The study evaluated differences in savings based on different types of jobs, such as industrial zone locates, residential locates, etc. The results reveal no statistically-significant correlation between the location/job type and other components. The notable exception is the Validation Jobs (QA). 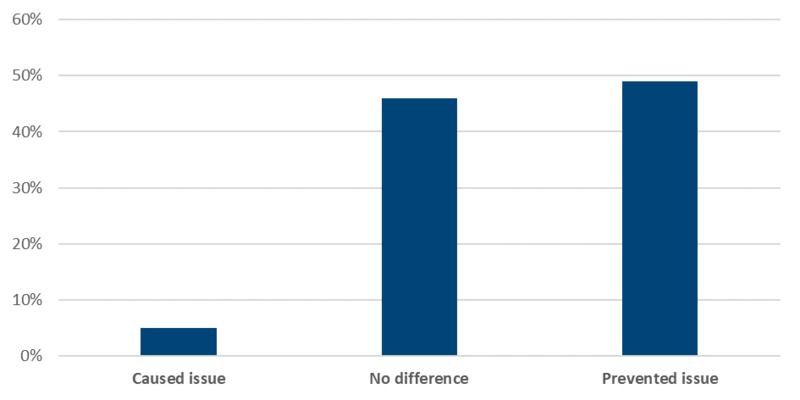 The time savings captured for locate validation jobs ranged from 66–90%, suggesting a high effectiveness of vGIS for such tasks. The impact on the ease of doing a job was captured by asking the study participants to evaluate each job using a three-level scale (vGIS made job easier, no impact, vGIS made job harder). For the measure of the system’s utility, Fig. 4 reveals that in 84% of the cases, the participants felt that the vGIS made the job easier, while it had no impact in only 16% of cases. There were no reports that the system had a negative impact on the locate job’s execution, suggesting that the study participants simply did not use the system in situations where they saw no value in it. In terms of safety, the system generally had no impact (85%). 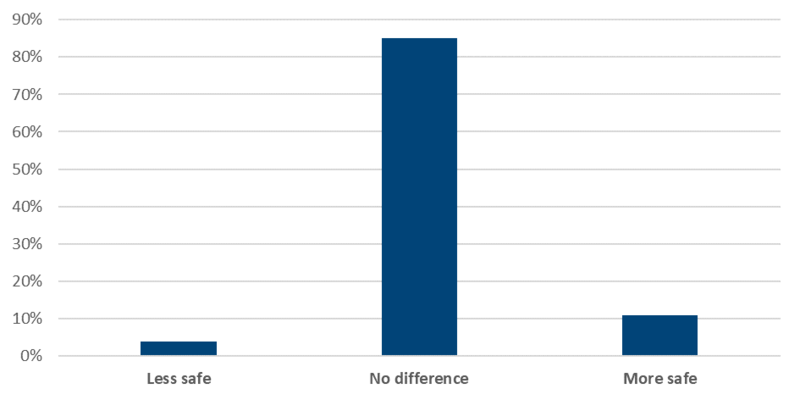 In 11% of situations, it increased safety, while in 4%, it had a negative impact. The notes provided by the participants suggested that the negative impact on safety was experienced when locators forgot to turn off their phones and walked into hazardous situations (e.g., oncoming traffic) while tracing lines using AR. Regarding the issue prevention aspect (Fig. 6), the system helped prevent issues in 49% of cases. Mostly, the issue prevention was observed on the locate validation side (supervisors “test” validated locates using vGIS, giving them peace of mind about the completed job) and when checking laterals, bends and other complex paths that pipes and cables may take. In 4% of cases did the system cause an issue. The problems arose from two components: data quality that misled locators and the quality of the base maps. Until now, the impact of using AR for utility locates was largely an area of hypothesis and speculation. This study collected evidence that allows evaluation of the effectiveness of AR tools in the field from multiple angles. Predictably, the study found that AR tools designed for utility locates provide tangible time savings. On average, utility locators could reduce the time required to complete jobs by 50%. At the same time, QA validation time was reduced by 66–85%. This translated to cumulative savings of 12–20 hours per locator per month. The study also demonstrated that the productivity impact is not uniform; for quicker locates (under 20 minutes), AR use does not offer much savings, while for all jobs longer than 20 minutes, the impact was consistent – a 50% time reduction. The overwhelming conclusion is that AR makes locate jobs easier (84% of all jobs). There is a substantial positive impact on issue prevention, with the system helping to prevent issues in 49% of cases. An unexpected finding was that the system had almost no impact on safety. While it had a moderate positive (11%) and occasional negative (4%) impact, in the vast majority of cases, it had no effect. The key finding of this study is that while more data is better (more in terms of the utility types and data completeness), AR has benefits even in environments with limited GIS data. Finally, by collecting first-hand comments, the study revealed the most underrated component of locate jobs—the GIS data quality feedback that locators can provide. By identifying assets in the field, locators can channel a wealth of information back to infrastructure owners, improving data completeness and quality. Surprisingly, such feedback is rarely collected or acted upon, suggesting that utility companies and municipalities are missing out on opportunities to update their records at virtually no additional cost. AR has revolutionary potential to improve fieldwork and operations. However, the benefits of AR are not uniform, and understanding where and how to apply it would help organizations allocate resources more efficiently. For specific use cases and recommendations on where—and more importantly, where not—to use AR, especially in the context of utility infrastructure, please contact vGIS at info@vGIS.io. This report is the property of Meemim Inc. Any reproduction in full or in part is expressly prohibited without the prior written consent of Meemim Inc.